This is the yield curve of government bonds. Before Demonetization it was roughly flat, with the 10 year around 7%. 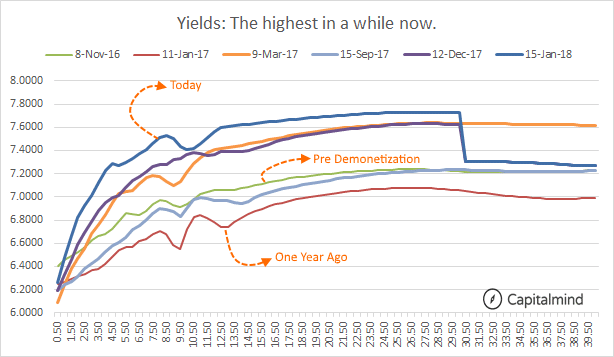 After demonetization the flood of money pushed yields to lows as the 10 year fell to around 6.5% but after that we see that yields have been going up gradually. Since September 2017 (before RBI’s rate cut) we have seen yields up by 0.5% to 1% across the board. It’s simple: this is effectively a hike in interest rates. If government bond yields rise, that means yields on corporate bonds rise. Which means that when a company wants to issue bonds to borrow, it will be paying a higher rate, higher by 1% compared to 6 months back. And when their old bonds mature, they typically pay them back by issuing more bonds, which again means their effective rates are higher. There’s no need to panic. This stuff takes time to evolve, and it’s almost like watching paint dry. To you it simply means that if you’re a debt mutual fund investor, let’s hope you have avoided most of the longer term bond funds or gilt funds. I wouldn’t buy any more of them even now. The budget is upon us. There is a big issue in the fiscal deficit – will the government borrow more? They’ve shown some signs – an increased borrowing in the Jan-Mar quarter, for instance. Then, the lower than expected GST collections. There’s also the 135,000 cr. bonds to be issued for the bank recapitalization program. (Read) There’s the fear that the government will, in it’s last real budget before elections, do something populist like cut taxes or increased social spending which could increase the deficit. We don’t know how it’ll pan out but the fear is quite real, looking at yields. Foreign investors continue to buy debt, which means they’re not running away. Indian domestics aren’t buying as much, but that’s probably because so much money is moving to equities instead. Let’s see how the budget pans out but till then I would avoid longer term bond exposure. The bond market is considered “smarter” than the equity market. If they’re right, then the news isn’t good. But nowadays, there is no such thing as a bad thing in equities – “just buy everything” is the new mantra. We’re invested, however at lower allocation levels, and we keep looking for why the market could reverse its insanity. The bond market might just be telling us why.